Back to one of our ongoing assessments, an annual retail survey of Crouch End town centre (see 2017 here, and 2016 here). Topical too, as few weeks go by without a newspaper article proclaiming the death of the High Street. So, another year on, how are things hanging down The Broadway? UPDATE AND EDIT, FEBRUARY 2019 – A few weeks and a few shop closures later, with the Earl Haig, Subway, Oddbins and Sorbet gone, Santander going, perhaps Evans Cycles too. This is a closure rate three times that of 2018 (see list below), but just as notable is the nature of the shops. Last year all 15 closures were independents – this year, they’re all chains. On the face of things, all seems quiet, the vacancy rate is still low (3.3%) with 11 vacant units, as opposed to 12 last year – far less than the national average of 12%. Even long standing empty shops continue to find occupants, such as 48c The Broadway (now Paesan Italian café/bar). There’s little news to report on the share of independents, estate agents or hairdressers. Nevertheless changing patterns are still evident in the composition of the district centre, and the share of the different sectors tell us how trends are developing – particularly the burgeoning food and beverage sector and the shrinking comparison shopping offer. Indeed, most of the national woes about the High Street are about the closure of comparison outlets – and relatively few of these shops now feature along the frontages of Crouch End. 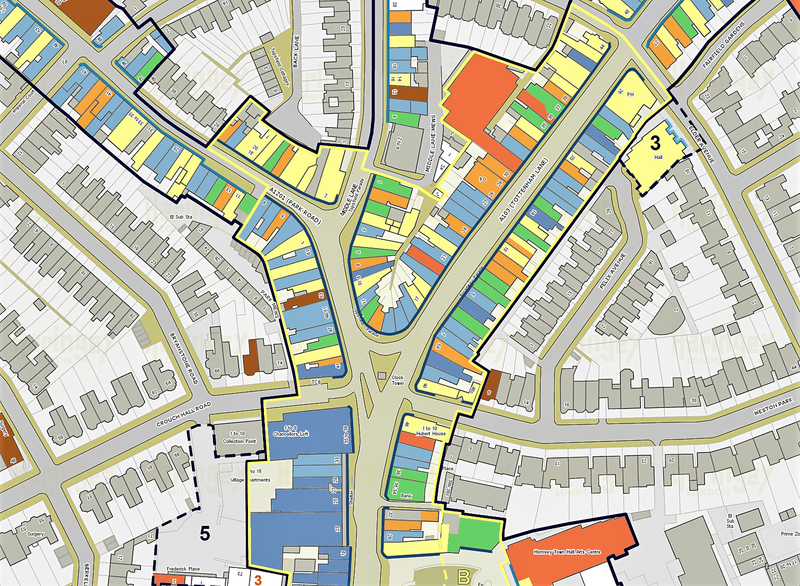 The likes of Woolworths are long gone, and the proportion of comparison retail in Crouch End is now a mere 19% of retail floorspace, and a significant slice of that are charity shops (take a look at the map insert above: the blue is comparison & convenience retail, yellow food & beverage, orange other services). But the big news of 2018 is that we appear, at last, to have reached peak coffee (and peak pale ale), with no growth in the number of units or % share of food and beverage operators. Of course this may be temporary, and the jury’s out on whether it’s good or bad for the future well-being of the town centre. Looking at other town centres this shouldn’t come as a surprise, and falling numbers of diners (and subsequent closures) has actually hit us later than other places. The offer very much remains a USP for Crouch End and still occupies 1 in 4 units. We’re monitoring (for instance, the future of the Earl Haig under new owners). Growth, such as it is, carries on in the service sector which now occupies 40% of floorspace (this includes ‘leisure’) and rises to 60% if your definition includes food & beverage. This is double the national average. It is no surprise that the new retail unit in the old Hornsey Journal building is rumoured to be a solicitors. Clearly services are crucial, though surely they too depend upon a successful mix of other uses. There were 23 changes during the year, fewer than previous years. Openings included Sharkey’s Cuts, Pure Dynamic Osteopathy (re-locating from HTH to their own space), Haven House charity shop, the Vape Shop, Tan-Hub, and the Mathnasium. 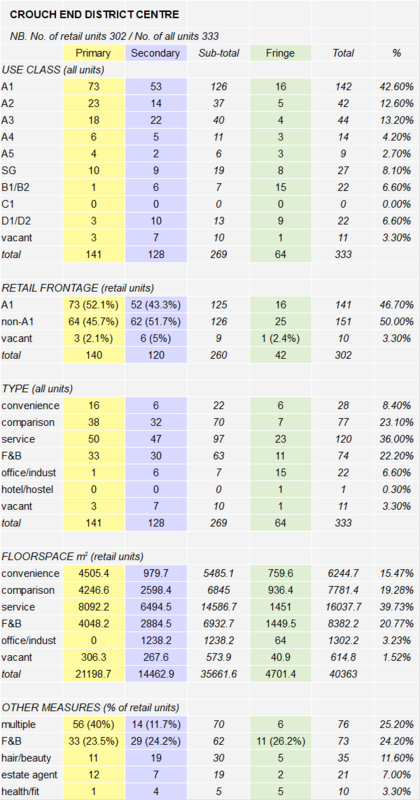 Fewer new bars, restaurants and cafés appeared but included Florians 2 (! ), Paesan, Little Mercies, Telepizza and the (retro-?) Montmartre Brasserie. 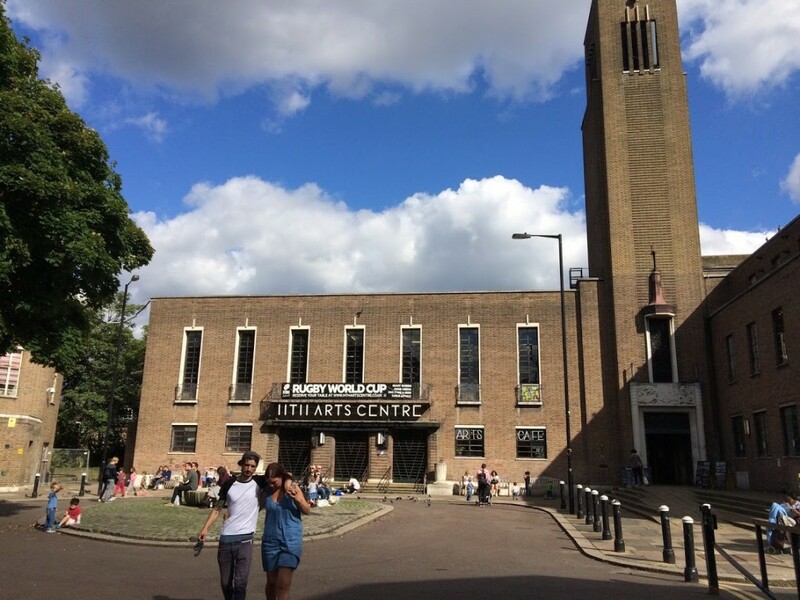 The Hornsey Town Hall Arts Centre changed hands, marking time ahead of the big restoration – and the Kerb market on the Square seemed to come and go. Other goodbyes to Ruby Rose, Riley’s ice cream parlour, the long standing Jade Palace, Cassius & Coco, the restaurant half of Cannon’s fish & chips, Real Domestic Appliances, and MEB Motors. There were a number of changes grouped on Crouch Hill as Blue Legume, My Space, Pearl & Turqoise, Little Green Shopper and My Creche all closed their doors. 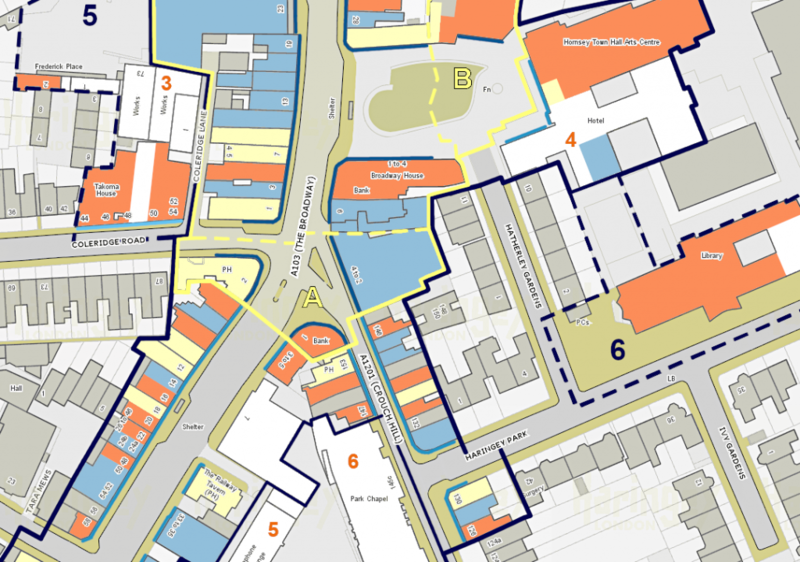 NB: The entire retail floorspace of Crouch End is 40,000 m2. This is classified as a relatively well-sized ‘District Centre’ (typically 10,000 to 50,000 m2). The convenience/top-up shopping sector looks set fair (hopefully including some of the valued independents), though the comparison shopping may only prosper as select ’boutique’ shops – and then only if we see footfall maintained and improved (the presence of numerous charity shops reveals the stress the sector is under). The service sector, leisure, gyms, hair and beauty, to solicitors and estate agents should continue to grow share. Lastly, even if further growth in the food and beverage sector appears limited the offer remains a USP for Crouch End. Balance is all of course, and good reasons remain to spend time in the town centre, whether it’s the gym, the salon, the bakery or the café. We particularly welcome the ‘Liveable Crouch End‘ initiative which although tasked with tackling traffic and active travel, is a (long overdue) opportunity to make street and pavement improvements; and also the Hornsey Town Hall development which offers the prospect of a new town square, a continued arts venue, and even a grade II* listed visitor attraction in its own right. The combination of these schemes, which will emerge gradually over the next three years, offers a tangible set of improvements which will hopefully attract greater numbers to the delights of CE. 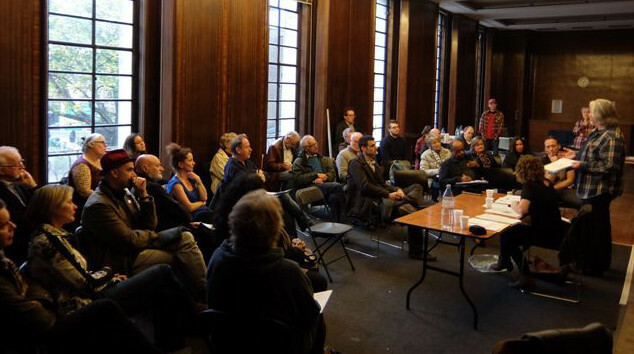 The Forum hope to build on these developments with policies to better protect and enhance the local heritage assets (including the parades and the shopfronts), and improvements to the local environment. It almost adds up to a masterplan. And January’s first news is that the Earl Haig is closing, last day this Sunday, January 6th…. I was just wondering where Crouch End runs out. Please, in all this stuff about F&B, remember that to really thrive, Crouch End also needs people to work here. The steady destruction of non-retail business space will turn us into a dormitory and/or hospitality destination place where everyone commutes in or out. Meanwhile, the main retailers have been announced for the big Finsbury Park development. A gym (Gymbox), a Marks & Spencers food hall, and – – drumroll – – a 9 screen cinema (Cineworld). Is it possible to have so many cinemas? And is this a threat to Crouch End, or perhaps you can hear the sound of a deflating Wood Green? I’m quite happy about the gym box, was thinking of joining the one at Victoria but Finsbury Park is far more convenient. I’m looking forward to the Wells Terrace entrance reopening and hope today’s announcement heralds that will happen soon. Finsbury Park tube station can be a mighty scary place when travelling to Crouch End late at night. As I understand it, the new Wells Terrace entrance will just be round the corner from the previous one – to get there you’ll be walking down a newly created street which pretty much runs parallel to the former pedestrian tunnel. So no further to go. However, that approach doesn’t open until August at the earliest. In the meantime they’re going to open up the new entrance – but the access will have to be via Fonthill Road, which will be as great a schlep as the walkaround you have to do now. There are genuinely worrying developments on our High Street. I believe Evans Cycles have put up their lease for sale and a planning application has just gone in to convert its premise into a restaurant (yes another one!). The Odd Bins chain has also just gone into administration. Not sure if the two stores in CE are franchises; hopefully they will survive. I guess on a more positive note, HTH development and the liveable neighbourhood scheme should help to bring in more investment and footfall to maintain the vibrancy of our town centre! I just heard from a waitress in Middey’s that they are closing down, or at least changing hands. After it took them so long to open in the first place, I found this very surprising. A few weeks and a few shop closures later, with the Earl Haig, Subway, Oddbins and Sorbet gone, Santander going, perhaps Evans Cycles too. This is a closure rate three times that of 2018, but just as notable is the nature of the shops. Last year all 15 closures were independents – this year, they’re all chains. As I understand it this means CE will score lower on an index based on the number of chains present. Which will make it less attractive to chains. Which will tend to discourage chains from taking up the vacant properties. might this become a vicious spiral. There are a lot of cheapjack clothing, saucepan and sofa shops on Wood Green High Street, where something similar seems to be happening. Absolutely correct. Is it destination decline? – what with further banking closures likely, and the KERB market didn’t do so well either. Of course Wood Green continues to have the full attention of Haringey Council, substantial public funds invested, and a local BID to market and promote the centre. Crouch End has little in comparison, apart, that is, from TfL’s Liveable Neighbourhoods active travel project. The LN really has to deliver for the local economy, and must not become a through traffic commuter project, no matter how many wheels they’re on. Anybody any ideas about the marketing and promotion of the local town centre?